In their words and imagery, marchers proposed an alternative model: a post-extractive vision in which the polity was not a machine that ran on fossil fuels but a plural collectivity of cultures and ecosystems. By the time they arrived in the capital city, their numbers had swelled to twenty-five thousand. 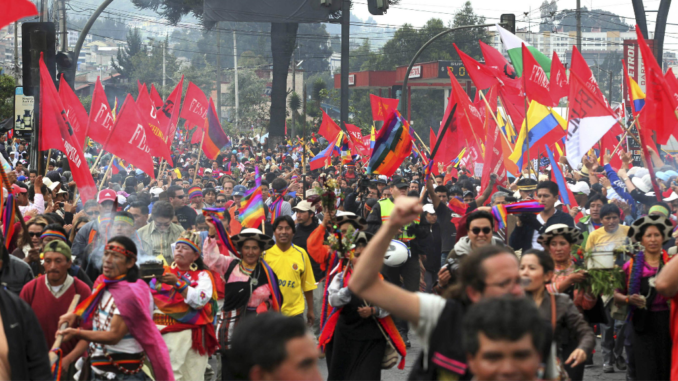 This expanding throng?— anti-mining banners and rainbow indigenous flags in tow?— was just one vibrant example of a larger trend in global politics of which Ecuadorian activists have been a forerunner: the explosion of anti-extractive movements. In recent years, this new form of politics has made its presence known everywhere from the copper deposits of the southern Amazon to the shale oil reserves of western Pennsylvania. Communities are fighting the expansion of the extractive frontier. They’re protesting fracking and oil pipelines, standing against environmental contamination and territorial displacement. Naomi Klein calls this new politics “Blockadia,” and sees in it the potential to go “beyond extractivism”: the “barricades of Blockadia,” she argues, are erected not only to resist socio-environmental destruction but also to demand democratic control over the conditions of our socio-natural existence. And crucially, by impeding fossil fuel extraction and environmental destruction, these movements?— in many cases led by indigenous groups?— hope to slow climate change’s advance. In Ecuador, petro-socialism drove a wedge between the left government and indigenous groups that before Correa’s rise were amongst the most powerful social movements in the Western Hemisphere. Their presence has been especially prominent in South America, where the ascendance of Pink Tide governments and a historic boom in global commodity prices reshaped the region. When the Left won power in the early 2000s, it had a robust mandate, programmatic clarity, and, importantly, the fiscal room to maneuver, thanks to rents from sky-high commodity prices. As a result, Chávez, Correa, Kirchner, Lula, and Morales could?govern?from the left, a rare feat in any context. Across the continent, these administrations reasserted state control over critical economic sectors that neoliberal politicians had allowed to be run by the dictates of capital, and made remarkable gains. They reduced poverty and income inequality, improved health and education outcomes, and made strides in democratizing the state, bringing in long-excluded groups. But in Ecuador, petro-socialism drove a wedge between the left government and indigenous groups that before Correa’s rise were amongst the most powerful social movements in the Western Hemisphere. Natural resources have long occupied a privileged place in the Latin American political imagination. In the face of imperial plunder and capitalist privatization, both populist groups and nationalist military regimes have held up oil and minerals as collective property for the people. In recent years, however, indigenous and environmental groups have taken a radically different stance. Rather than demanding oil for the people, they increasingly take aim at the extractive model itself. The relentless exploitation of natural resources, they argue, pollutes the environment, violates collective rights, reinforces dependency on foreign capital, and undermines democracy. A post-extractive economy?— not socialized extraction?— is their utopian vision. The intra-left battle over extraction reached its most intense pitch in Ecuador. Indigenous groups that helped pave the way for Correa’s rise by leading the battle against neoliberalism broke sharply with the government, interweaving claims to territorial sovereignty with a radical environmentalism vigorously opposed to new extraction projects. The state has been divided in its response. Some state officials have echoed movement calls for a transition to a “post-extractive” economy, while others?— most notably Correa himself?— have accused anti-extractive activists of being traitors to the nation and tools of imperialist powers. For decades, Ecuador has been a petrostate, dependent on rents derived from oil extraction and export. In the early 1970s, amid a global oil boom, the nationalist Rodríguez Lara military government avidly promoted newly discovered oil reserves as an anti-imperialist route to economic development. The junta established a state-owned petroleum company, invested in domestic industry, redistributed land, instituted price controls, and organized peasant cooperatives. These reforms, combined with boom-fueled growth, yielded reductions in poverty and improved living standards. Though this experiment in resource nationalism was short-lived?— declining oil prices and a backlash from foreign oil companies soon spelled its demise?— it left as its political legacy the recurrent aspiration to reclaim oil from foreign capital and conjure development from crude. The arrival of neoliberalism in the early 1980s did away with the developmentalist approach to natural resources. Eager to attract outside investment, a series of governments lowered taxes, weakened environmental regulation, and opened up new concessions for bids on exploration contracts. In response, a broad coalition of popular organizations?—most prominently, the national indigenous federation (the CONAIE), oil workers’ unions, and an umbrella group called the?Coordinadora de Movimientos Sociales?— fashioned a new radical resource nationalism. The Rodríguez Lara government’s developmentalism had been state-heavy and stopped short of criticizing capitalism; these groups envisioned democratic, popular sovereignty over the economy and the extraction that fueled it. Resources, long stolen by foreign capitalists in collusion with domestic elites, were conceived of as the people’s rightful heritage, to be owned and managed collectively. The problem, as they saw it, was not extraction or even export, but the ownership and regulatory regime that had funneled the revenues into private coffers, leaving poverty and underdevelopment in its wake. Rather than struggling against extraction, CONAIE’s 1994 political program reclaimed sovereignty over resources, while also trying to transform the nature of national sovereignty itself. Oil workers were also key architects of radical resource nationalism. 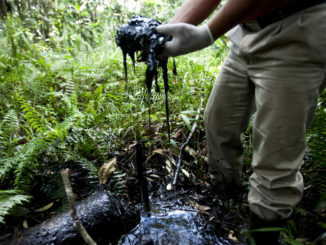 In February 2002, the environmental justice group Amazon Defense Front and the oil workers’ union (Federation of Ecuadorian Petroleum Workers, FETRAPEC) led an eleven-day oil strike in the northern Amazonian city of Lago Agrio to protest the construction of a privately owned and operated pipeline (Oleoducto de Crudos Pesados, OCP). “We cannot lose sight of the fact that the main objective of a country such as Ecuador is to eliminate poverty. And for that we need our natural resources.” – President Rafael Correa. It wasn’t the first time the union had resisted such privatization schemes: in the mid-1990s, oil workers launched a hunger strike to protest plans to put the older, state-owned pipeline (Sistema de Oleoducto Transecuatoriano?or SOTE) in private hands, forcing the government to suspend the initiative. But in 2002, the state met workers with extreme repression. Around the same time, a contract with Occidental Oil became another flashpoint. In 2000, Occidental (“Oxy”) had violated Ecuadorian law by transferring 40 percent of its economic interest to another oil company without first receiving ministerial approval, officious behavior that many protested as the latest corporate encroachment upon national sovereignty. In August 2005, residents and local elected officials launched an eight-day oil strike in the northeastern Amazonian provinces of Orellana and Sucumbíos. Strikers occupied airports, roads, and oil wells, resulting in hundreds of millions of dollars in economic losses. They demanded the termination of the contract with Occidental and the nationalization of oil to fund social and economic needs, and insisted that no more oil contracts should be settled without Amazonian communities’ and local governments’ consent. Two strains of left social mobilization that would come into conflict under Correa?— nationalist resource sovereignty and nascent anti-extractivism?— were at this point unified in a popular front against neoliberalism. The Alfredo Palacio government conceded to demands for local investment, but protesters didn’t let up. In the Amazonian region, ongoing mobilization in Shuar and Achuar communities alongside non-indigenous farmers culminated in protests in Quito against Oxy and a proposed bilateral free trade agreement with the United States on May 8, 2006. The march?— staged “in defense of sovereignty, natural resources, and national dignity”?— received support from the radical environmental group?Acción Ecológica, the CONAIE, a national umbrella federation of unions (Frente Patriótico), the oil workers’ union, and the indigenous political party?Pachakutik. 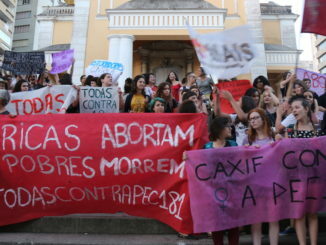 The Palacio government downplayed the protest but again ultimately met the demonstrators’ demands. On May 15, 2006, they terminated the contract with Occidental Petroleum. Meanwhile, as the oil frontier expanded to new territories, a new form of resistance to oil was more clearly taking shape. In Quito and in the northern Amazon, radical resource nationalism still guided the social movement response to neoliberal oil policy, and, in the case of the oil strike and anti-Oxy protests, won concrete political gains. But, alongside and intertwined with resource nationalism, indigenous activists in the central and southern Amazon were expanding their position from a critique of particular oil companies or ownership structures to a more encompassing condemnation of the oil-based development model. After decades battling logging, agro-industry, and state-sponsored colonization of highland peoples in the Amazon, these indigenous groups viewed oil exploration as yet another threat to their territorial autonomy. In January 2005, in response to the proposed expansion of oil extraction to the central and southern Amazon, the Sarayaku people, and the Shuar and Achuar nations?— whose territory overlapped with new oil blocks?— emerged as vocal opponents of oil extraction itself. As conflict heightened not only with foreign oil companies but with the state-owned oil company Petroecuador and state ministers, the presidents of the Sarayaku Association and the Interprovincial Shuar federation (FISCH) came out in opposition to oil extraction and declared the authority of indigenous communities to manage the subsoil resources in their territory. Their statements invoked the concept of?el territorio?— the socio-natural space of cultural and ecological reproduction — that had been forged over decades of struggle to defend ancestral territory against the encroachment of state-led colonization efforts, and oil and logging companies. These localized oil conflicts laid the foundations for anti-extractivism. But it was not until Correa came to power that oppositional social movements would gather under that banner. On the eve of Correa’s election, the national indigenous federation was in a rut as the broad popular coalition it had assembled just a few years earlier began to dissipate and fragment. But an anti-neoliberal mood suffused the political field, and Correa and his new party Alianza País stepped forward to fill the vacuum, securing a resounding victory in the second round of the 2006 presidential elections. Proudly trumpeting its adherence to “twenty-first-century socialism,” the new administration saw in oil and large-scale mining the opportunity to deliver on the long-deferred promise of equitable national development. Correa claimed that his administration constituted a definitive rupture with “the long night of neoliberalism” and that he would reassert state control over the economy, particularly natural resources. Policy practice, however, proved less radical than rhetoric: rather than the outright expropriations that occurred in mid-century Latin America, Correa’s reassertion of national power took the form of renegotiated contracts that increased taxes and royalties. Foreign capital continued to loom large. Oil financed one-third of the state budget, on average, but spending outpaced revenues, and the government racked up $17.4 billion in Chinese loans. Relationships with many social movement leaders and leftist intellectuals?— who had supported Correa’s candidacy?— soon began to fray. Unlike Bolivia’s MAS, Alianza País was an electoral vehicle, not a movement party, and intra-left tensions mounted during the 2007-–8 constitutional assembly. Although the resulting constitution recognized new collective rights, the Kichwa concept of?buen vivir? (living well), and the rights of nature, the drafting process was rife with disputes over the scope and content of indigenous self-determination, and the extractive development model. Gradually, anti-neoliberal social movements began to dispense with nationalist rhetoric (“resources for the people”) and adopted a new stance: anti-extraction, full stop. The 2009 Mining Law was a key extractive sector, calling into question the collective rights recognized in the new constitution and galvanizing protests across the highlands. As the administration increasingly promoted new extractive projects, justifying them as national development, oppositional social movements aimed squarely at the extractive model, in language and action. Though oil had sparked localized resistance in the past, the Correa government’s ardent promotion of large-scale mining?— which removes mountains, poisons water, and dispossesses communities?— raised the stakes. For activists, large-scale mining was a fork in the road: the country would either continue down the path of extraction, or it would veer off in a completely new direction, toward both popular sovereignty and environmental sustainability. 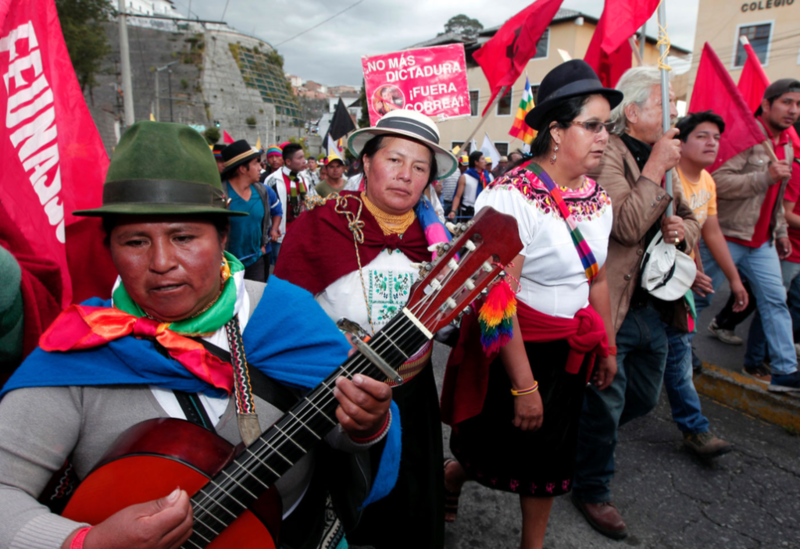 Anti-extractivism wasn’t just new for Ecuador?— it marked a departure from classic left concerns: the mode of production, the property regime, the pattern of distribution, the regulation of the economy, and the means to development. At its most unadulterated, anti-extractivism regarded these concepts and their political targets as not only insufficient but as guilty of reproducing the developmentalist and “anthropocentric” pathology that they saw as the essence of a “Western civilization” imposed via colonialism. Anti-extractivism radically de-centers human beings in a way that was prefigured by the new constitution’s recognition of nature as the subject of rights: crude and ore are protagonists; wetlands and mountains moral agents. Anti-extractivism elicited a range of responses from state actors. Some officials reiterated elements of this critical discourse; others dismissed anti-extractive activists as enemies of the state. But no matter their reaction, they were responding on anti-extractivists’ terms. Anti-extractivism succeeded in reframing the debate. The political power of anti-extractive resistance lay in part in its track record disrupting strategic oil and mining projects. Extraction’s effects travel to distant locales by air and water, and through the complex relationships between points of extraction and points of consumption, whether in the form of burned fossil fuel or redistributive social investment paid for by resource rents. So activists resisted it at every level. Lost in this internecine dispute is the radical promise of twenty-first-century socialism: that ordinary people can exert collective, democratic control over the conditions of their existence. Such a program could demand both the redistribution of oil and mining revenues?and?a transition away from the very extractive model of accumulation that generates those revenues. Their critique of extraction also touched an ideological nerve with the leftist government. For some state officials, the anti-extractive critique dovetailed with their goal of a “post-extractive” economy: reducing reliance on low value-added primary exports and replacing them with research and ecotourism sectors. Another, more powerful, set of actors was less sympathetic. Summoning nationalist, anti-imperial language, these figures argued that opposition to extraction was tantamount to treason. 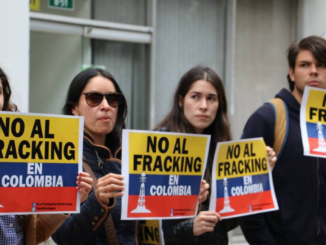 This latter group went so far as to criminalize protest: during its tenure, the Correa administration pursued legal action against roughly two hundred people for participating in anti-extraction demonstrations. And in December, the outgoing government instituted a state of emergency in the Amazonian province of Morona Santiago?— the site of a mining camp occupation?— and ordered the military and police to raid indigenous Shuar communities near a large-scale mining project, forcing residents to flee into the mountains. The battle was reflective of a fight within the Left to define what a progressive development model in the Global South should look like. In a 2012 New Left Review?interview, Correa made the case for including extraction as part of that vision. It is madness to say no to natural resources, which is what part of the left is proposing?— no to oil, no to mining, no to gas, no to hydroelectric power, no to roads. This is an absurd novelty, but it’s as if it has become a fundamental part of left discourse.?.?.?. We cannot lose sight of the fact that the main objective of a country such as Ecuador is to eliminate poverty. And for that we need our natural resources. Correa’s discourse veered on caricature, but identified real challenges facing a movement opposed to extraction in all forms. Radical resource nationalism?— which the Correa administration redeployed, albeit in somewhat diluted form: no nationalizations; lots of courting foreign oil and mining companies?— elevated a mass political subject against a widely despised figure, the foreign capitalist. It dramatized the resistance to neoliberalism and solidified a popular sector coalition, tying together groups with distinct histories of struggle: indigenous organizations, labor unions, urban movements. It called for concrete changes in the structure of ownership and regulation, framing these as necessary to address the unmet needs of the people. Its narrative structure was progressive and teleological, promising a bright future of reclaimed sovereignty and widespread prosperity. The narrative of anti-extractivism, on the other hand, is more complicated. Many indigenous and environmental activists declare their opposition to extraction, but rarely define its limits: does small-scale mining count? Industrial agriculture? And how about an alternative vision? Proposals often amount to a pastiche of imagined pre-colonial pasts and nebulous extraction-free futures. Despite the difficulty of building a mass movement around resistance to the extractive model, anti-extractivism has delivered social movements concrete victories, and upended accepted notions about collective action. Several campaigns have forged urban-rural coalitions and in the process rescaled who counts as “directly affected” by extractive projects. Inhabitants of Cuenca, Ecuador’s third largest city, have joined?campesino?activists (often organized in community water councils) in the rural highlands living just outside the municipal lines to resist mining projects that would affect their shared water supply, which irrigates dairy and vegetable farms and serves urban residents. The anti-mining mobilization has helped stall development of the planned Quimsacocha gold mine, one of the government’s five “strategic” mining projects. 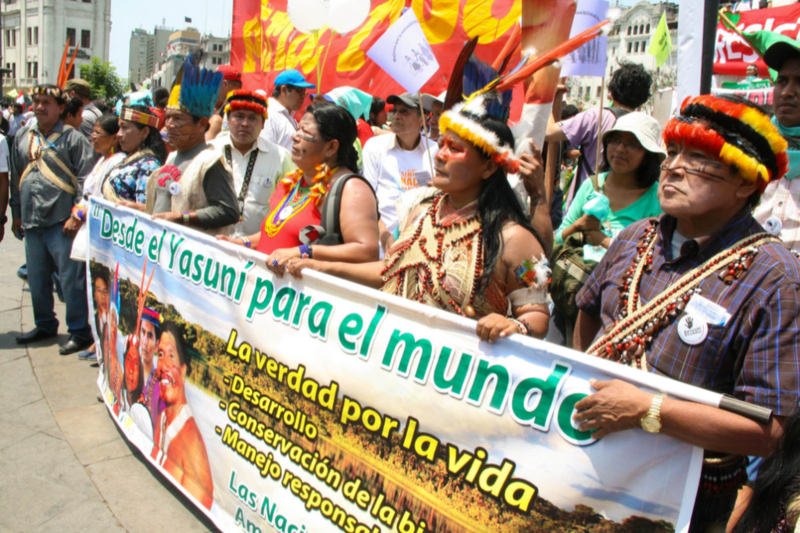 In 2013, a network of activists across the country mounted an impressive campaign to prevent oil extraction in the Yasuní National Park. The administration had previously adopted a civil society proposal to forgo oil extraction in the park, in exchange for $3.6?billion in sustainable development donations from the international community (a bid to pay back the “ecological debt” that the Global North owes the Global South after centuries of resource plunder). When the government failed to attract enough donations, Correa pushed ahead with the previously shelved plan, sparking the formation of the activist network YASunídos. The campaign drew huge protests in major cities far from the sites of extraction. Though they failed to stop Correa’s about-face, the resistance reached a scale?— both in numerical size and territorial expanse?— comparable to the large protests against Occidental Petroleum and free trade in 2005 and 2006. At the same time, the resistance at Yasuní also highlighted one of the anti-extraction movement’s central challenges: how to mobilize the majority of poor Ecuadorians, who don’t experience the direct effects of oil and mining projects and who enjoyed real gains under Correa. For many of them, the calculation is clear: support the economic goose that bequeathed long-denied material benefits. Hence his administration’s consistently high approval ratings and electoral victories?— including in the April presidential elections in which Correa’s former vice president, Lenín Moreno, defeatedbanking magnate Guillermo Lasso. A creative response to the extractive model might emphasize that it not only causes environmental destruction but has also produced new forms of inequality and private enrichment. Paradoxically, the availability of easy resource rents during the boom enabled the Correa administration to govern from the left by increasing social spending without radically transforming power relations. Today, land tenure remains highly unequal, and oligarchic business groups dominate large swaths of the economy. Cash transfers have put oil money in the pockets of the poor, but private firms reap the profits as soon as they spend it. The collapse in oil prices triggered a decline in resource rents, which then forced the government to make massive cuts to social spending and state pensions. At the same time, the expansion of oil and mining has stoked the country’s debt to China, reinforcing its geopolitical dependency. The benefits that Correa’s government delivered to the poor were real. But they’ll always be in jeopardy under the present development model, where the web of class relations is left virtually untouched. In 1994, as massive mobilizations against neoliberal land reforms roiled the country, the CONAIE outlined a vision for a “Planned Ecological Communitarian Economy.” Two decades later, “socialism” and “anti-extractivism” have come to represent distinct, perhaps inimical, political positions. Socialism in Correa’s usage meant state investment and spending in the pursuit of national development that essentially left intact existing class relations. Anti-extractivism referred to the radical defense of particular territories against extraction that didn’t mobilize a broad social bloc of the oppressed, including, critically, the majority not directly affected by extractive projects. Lost in this internecine dispute is the radical promise of twenty-first-century socialism: that ordinary people can exert collective, democratic control over the conditions of their existence. Such a program could demand both the redistribution of oil and mining revenues?and?a transition away from the very extractive model of accumulation that generates those revenues. But doing so would require confronting the political and economic forces that profit from the status quo, including foreign oil and mining firms, large landowners, and oligopolistic business groups. In Ecuador, both left populism and anti-extractivism were forged in the crucible of anti-neoliberal struggles. In its drive to privatize and marketize social life, capital provoked a counter-movement that transcended defensive resistance and began to imagine a radically different world: communitarian, ecological, plurinational, democratic. This counter-movement drew its power from its unity across social divides. Tragically, it was only after a left government took power that socialism became untethered from environmentalism and that the basic needs of the masses were counterposed to indigenous collective rights and an uncontaminated environment. This false dichotomy?— the positing of socioeconomic and environmental justice as mutually exclusive?— reflected historical circumstances but was not inevitable. Rather, it was shaped by a series of strategic decisions made by the Correa government and social movement leaders in the heat of political conflict. In the face of gaping inequality and deepening ecological crisis, governing from the left is a daunting task. But continuing existing models of natural resource extraction won’t put us on the road to economic democracy and collective emancipation.